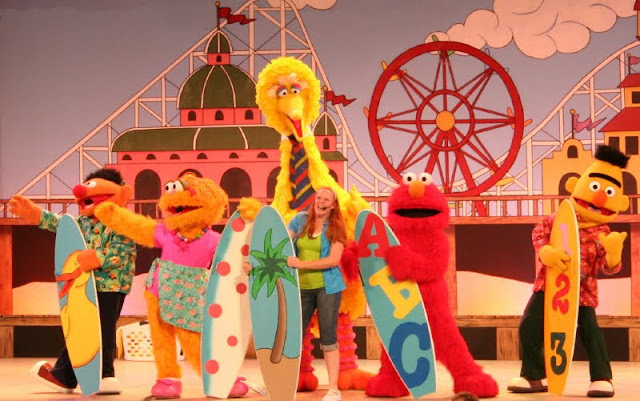 Big Bird's Beach Party was a stage show at Sesame Place that performed at the "Big Bird Theater" (now "Monster Rock Theater") from 2004 until 2009. The show and has played at Sea World and is currently playing at Beaches resort. The perform a version of the Sesame Street song "¡Hace Calor! (It Sure is Hot!)" written by Paul Jacobs & Sarah Durkee. Big Bird complains about the heat, Bert comments that his debarment isn't working and Elmo wishes they had a beach right on Sesame Street. Gabby polls the audience and they decide to go by car. Elmo produces a steering wheel and they break into song. The cast performs a rendition of "Let's Go Driving" a 1982 Sesame Street song written by Jeff Moss. They leave the stage and travel through the audience. The gang celebrates their arrival at the beach, all except Telly who has a fear of water. Soon the cast sings a Beach Boys medley that includes Surfin USA and Fun, Fun, Fun. Ernie tells us he is going to hide a sea shell so Bert can try and find it. Bert thinks of sea shells as "the paper clips of the ocean." Bert looks for the seashell as the audience yells "hot" or "cold" depending on how close he is. This leads to the hula dance portion of the show. Three dads from the audience are asked to come forward and put on hula skirts. The cast sings the hula song "Pearly Shells" as the dads dance with the cast. Still, Telly is afraid and runs off stage. Big Bird spots a flying fish and then imagines what it would be like to be a fish. Big Bird sings the Christopher Cerf 1992 Sesame Street song "In Your Imagination" as the cast joins him onstage with fish puppets. Telly returns and Ernie helps him with his fear by getting him to pretend the ocean is "a giant bathtub filled with rubber duckies." The cast sings the Bobby Darin song "Splish Splash" as they realize the day is coming to an end. For the final number (a reprise of "Splish Splash") the cast is joined by The Count, Grover, Cookie Monster, Baby Bear, Rosita, Abby Cadabby and Prairie Dawn. This was the largest cast ever for a Sesame Place stage show. Woah! This would have been so much fun. I wonder why I never thought of such a celebration. It is my nephew’s birthday next month and I have planned a surprise party in one of the San Francisco venues. I must give it a shot.